At six o’clock or so every morning — significantly later if you’re lucky — phones and clocks around the world start beeping and buzzing and doing all sorts of other noisy things. Often, those devices met with a grumble and a slap of “too soon!,” but hey, we’re the ones who told them to do that in the first place. Waking up can be hard to do, but if you want to get to work or school or wherever-else on time, alarm clocks are pretty important. But alarm clocks are relatively new (and phones that can accomplish that same task are even newer). The first mechanical alarm clock was patented in the late 1800s, but this was before the Industrial Revolution. Society’s ability to mass-produce mechanical ways to wake us up wasn’t coming until at least the 1920s. Workers, though — and that constituted someone in just about every family — still needed to be woken up each morning. Absent a mechanical solution, how did people wake up in the morning? That was the case in England, at least. These people were called “knocker-ups” or “knocker-uppers,” a name which described the act they’d perform each morning. The knocker-up would come to your window, give it a few taps, and then wait to make sure you had awoken. If you had, great — he or she moved onto the next house. 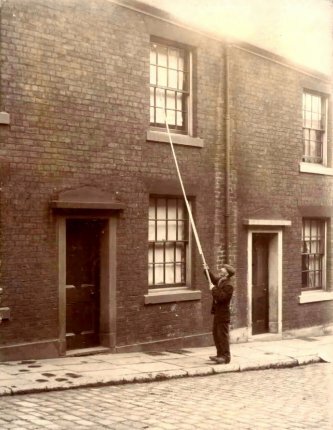 If not, they were typically charged with trying again, as knocker-ups were often only paid if they waited to ensure that the customer had, indeed, woken up. The job paid a few pence a week and was often performed by the elderly, by women, or by off-duty policemen while moonlighting, per Wikipedia. Mental Floss notes (in an article about six other alarm clock substitutes) that some factories would hire their own knockers-up to wake factory employees. And a letter to the editor of the Guardian (from New Zealand) says that some mining communities would pay a “knocker,” who knew what time to wake each person based on a slate sign on each door — some of which are still visible today. Regardless, the solution was human-intensive and rather low tech. And it was phased out pretty quickly — once alarm clocks could be produced cheaply, the job of knocker-up quickly disappeared. Bonus Fact: During World War II, U.S. factories stopped producing whatever they were normally producing and instead began making items for the war effort. That switch included a temporary end to the production of alarm clocks, as the parts and labor were needed elsewhere. But while most of the wartime manufacturing restrictions lasted until (or even past) the end of the war, alarm clocks were given a special dispensation, and were allowed to be produced again beginning in November of 1944. As Wikipedia explains, that’s because the pre-war alarm clocks began to break down. With no new clocks to replace the broken ones, an ever-increasing number of workers weren’t waking up on time — and therefore, were missing their factory shifts. The U.S. government decided to allow for the production of new alarm clocks in order to solve for this problem. From the Archives: Telling Thyme: Using spices as a clock. Related: A book about the history of clocks. It has an unnecessarily long title but has decent reviews.